One of my favorite parts of the USC OT program is that our learning doesn’t just stop in the classroom. 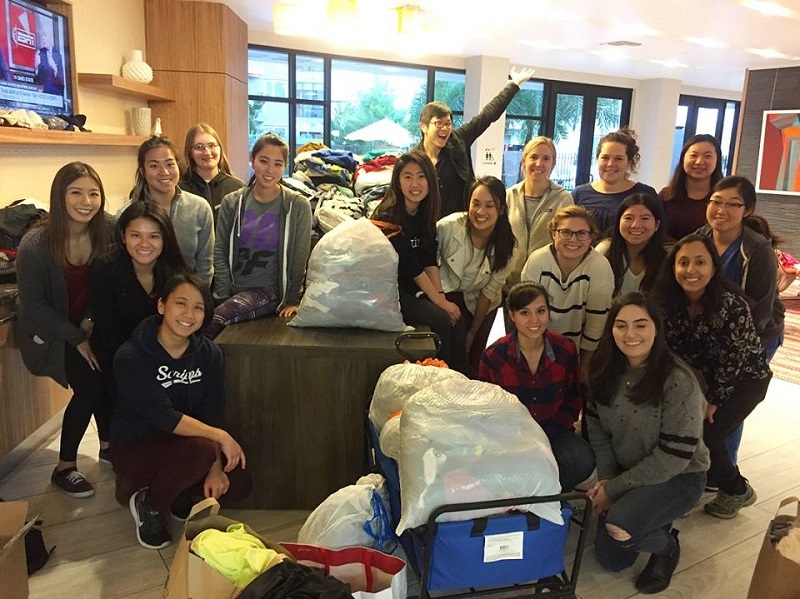 Whether it’s going out to a hospital for fieldwork or to skid row to volunteer at the USC Student-Run Clinic (SRC), there are endless opportunities to apply our OT knowledge. One of the amazing opportunities we have to get involved through our Adulthood and Aging course is the Interprofessional Geriatrics Curriculum (IPGC). IPGC is a chance for us to work with students from different disciplines including physical therapy, medicine, physician’s assistant, pharmacy, social work, and psychology. We get divided into teams and then paired with an older adult living in a low-income community housing complex. Throughout the semester we spend a few Friday afternoons at the community housing complex where we get brief lectures on topics related to our visit, such as oral health, cognition, fall prevention, and psychosocial issues. After our lecture, we meet with our older adult to learn more about them and apply what we learned during our lecture. This past Friday, I had my first IPGC visit where we started out the afternoon with a lecture on medication management and nutrition in older adults. Professors from pharmacy and medicine gave us resources, such as the Beers list, to utilize in our future practice. After our lecture, we broke up into our teams and met our older adult who we will be working throughout the rest of the semester. We spent a lot of time building rapport with our resident and getting to know her story. My teammates and I discussed her various medications and different side-effects that may occur from those. As an OT student, my main role was teaching her how to utilize a pill box organizer and implement taking medications into her daily routines. We also discussed the importance of healthy, balanced meals and how this can influence the aging process. The afternoon flew by so quickly that we were all sad to have our time come to an end. I felt as if we really got to know our resident and build rapport with her. After we met with our resident, our team debriefed on what went well for us as a team and identified strategies to improve on for next time. As occupational therapists, we often work in teams so learning how to navigate conflicts and communicate effectively is key and IPGC is the perfect place to begin practicing this. DiversOT is a student organization that is aimed at increasing cultural awareness of OT students, faculty and staff through sharing culture, traditions and experiences of diverse groups within the Chan Division. Engage is the OT House’s community outreach program which fosters relationships between USC graduate students and our surrounding community. OT students volunteer by designing and participating in recreational activities for at-risk elementary school children. Integrative Health Association (IHA) aims to provide opportunities for students to learn about methods and evidence in Integrative Health, the integration of complementary, alternative and conventional healing methods. Occupational Therapy and Science Council (OTSC) consists of every student in the Chan Division and has an executive board of members who work diligently to represent all interests of the student body. They create opportunities for our students to engage in philanthropic learning opportunities, to attend talks surround practice areas of interest for professional development, as well as create a sense of community amongst the Chan Division. OTs for OuTreach builds and strengthens the sense of community for LGBTQ students and allies by providing opportunities for social engagement and professional development. OTs for OuTreach members volunteer through developing programs and implementing engaging activities for diverse, marginalized and underserved populations. This organization has previously worked with the USC LGBT Resource Center, the Los Angeles LGBT Youth Center, and the Los Angeles County Central Juvenile Hall. Pi Theta Epsilon (PTE) is the national honor society for occupational therapy students and alumni. PTE at USC sponsors various events throughout the year to promote student scholarship, showcase student and faculty research and engage in interdisciplinary work. The Pre-OT Club is open to all USC undergraduate students who are interested in learning more about the field of occupational therapy. The Pre-OT club hosts events such as visits to OT practice sites, opportunities to shadow practicing clinicians, networking opportunities, and advisement for the application process for the Entry-Level Master’s program. 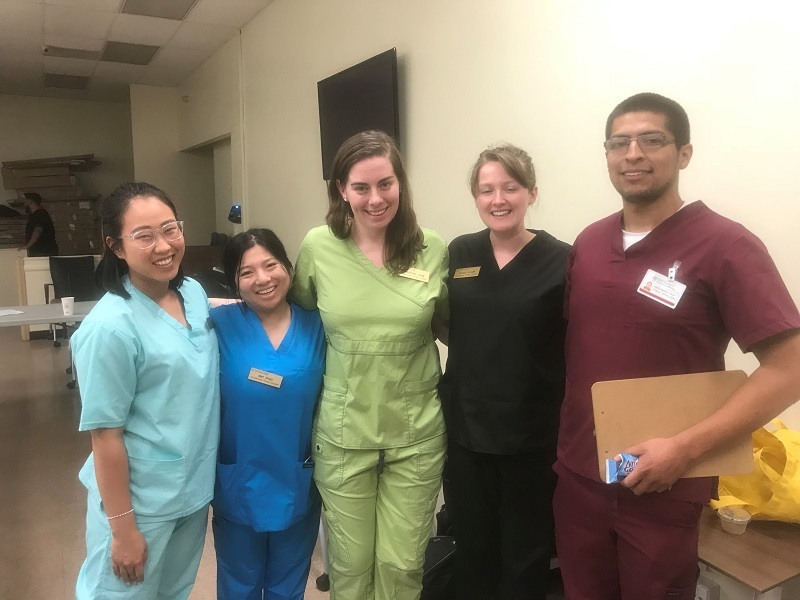 The USC Student-Run Clinic (SRC) delivers quality patient care to the underserved people of Los Angeles and enhances health professional education through an inter-professional, team-based approach to health care. Students from four professions (occupational therapy, medicine, pharmacy, and physician assistants) work together to assess, diagnose and optimize the patient’s health and lifestyle to suit their individualized needs. At USC, our Level I Fieldwork is tied in with the 3 different immersion courses: Adult Physical Rehabilitation, Mental Health, and Pediatrics. But wait…what is fieldwork? As Caroline explained here before, our Level I Fieldwork is a site that students go to once a week throughout the semester and one full week about halfway through the semester. We get experience in 3 different practice areas at a variety of sites across the Los Angeles area. 1. Dress the part. On your first day, make sure you dress accordingly with the site’s dress code. Some sites may ask you wear scrubs and your white coat, while others may require business casual. I always error on the side of more formal because it is better to be more dressed up than down! 2. Come prepared. Bring copies of all the documents you may need to start, such as your HIPAA certification. Make sure to bring pen and paper as well to take notes throughout the day. 3. Keep your eyes open. The goal of Level I Fieldwork is to get exposure to OT in different settings, apply what we are learning in classes to practice, and to develop understanding of the needs of the patients. Whether your fieldwork site allows you to be hands-on with patients or not, there is always something you can learn by observing therapeutic interactions. 4. Ask questions. Fieldwork experiences can sometimes be very different from what we see and hear in our classes. Ask your clinical instructor questions about why they did what they did, it will help you to understand their clinical reasoning. If you have questions while you are with a patient, write them down to ask later. 5. Know your learning style. Before our fieldwork, students at USC are asked to complete a learning style inventory. It is important to know how you best learn and share this with your clinical instructor. 6. Use your resources. Throughout all of our fieldwork experiences, we have an entire fieldwork team, along with faculty to support us. They are always available if you have questions, need advice, or just want to discuss how fieldwork has been going. Remember, Level I Fieldwork is all about the learning experience. There is no better way to solidify what we learn in the classroom, than to see it out in the field! It has been quite some time since I last blogged as the summer student ambassador, but I am thrilled to begin blogging again and sharing my occupational therapy journey. The past year has been a whirlwind, starting the master’s curriculum and graduating with my bachelor’s degree in occupational therapy this May. 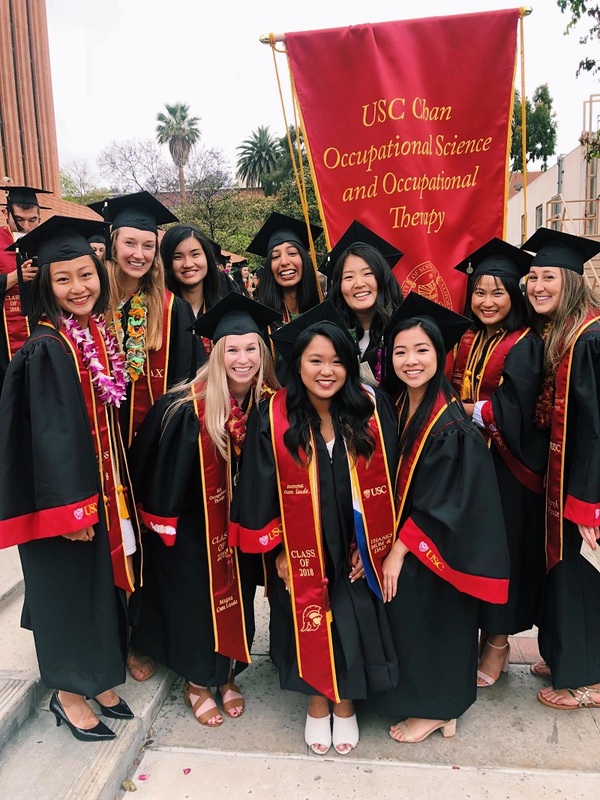 I have previously talked about my experience falling in love with OT and why I chose USC, but after immersing myself in the master’s program I feel even more passionate and lucky to be able to pursue the profession I love. Last fall, I began my OT grad school journey with the mental health immersion and I loved being exposed to areas of OT I had never seen before, such as in forensic mental health. At times, I felt overwhelmed by exams, quizzes, and projects but this summer I was able to reconnect with the reason why I am pursuing OT: to help others. 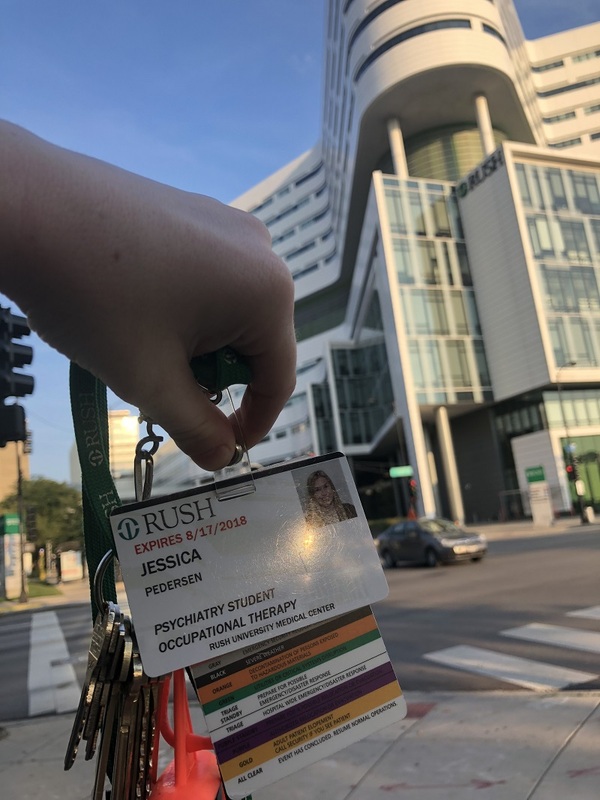 This past summer, I completed my Level II Fieldwork at Rush University Medical Center in Chicago, IL. When deciding where I wanted to do my fieldwork, I chose to go out of area to explore a new city for the summer. At Rush, I worked on four different inpatient psychiatric units – child/adolescent, general adult, mood disorders, and geropsych. Throughout my Level II Fieldwork, I realized how prepared I was to be an entry-level practitioner from everything I had learned in my classes and previous fieldwork experiences. Since I was able to work with clients across the lifespan, I learned how to rapidly shift the different therapeutic modes I was using based on the client and situation. Over the twelve weeks, I gradually gained more independence and eventually was carrying a full caseload where I evaluated 3 patients daily and ran 2 groups. In addition to assessments, treatment plans, individual interventions, group interventions, and progress notes, I was also able to pursue research on OT’s role in medication management in this setting. I loved being able to apply evidence-based practice and see the progress in my clients. Coming back after my fieldwork experience, I feel more prepared and energized to take on my second year! This summer working as a student ambassador has been one of my most memorable experiences at USC so far. From giving tours to prospective students to going to Meet USC events to speak to high school students, I have been busy spreading OT love everywhere. I am even more confident now than I was three months ago that I am pursuing the perfect profession for me. The past few months I have learned more about the diversity within OT and all of the opportunities we have as occupational therapy students. Now when someone asks me, “What is OT?” - I always have an answer, and I could probably go on talking about OT for hours. Next Monday I start the master’s portion of my academic career, beginning with the mental health practice immersion. I can’t wait to push myself even further to begin shaping myself as the occupational therapist I know USC will help me become. Being apart of the OT family at USC has opened doors to so many things and I know it will continue to do so for a lifetime. I hope that everyone has a great fall semester and fight on! !